My mornings are pretty routine each week. After waking up at 5:00, I only have eyes for my coffee. Breakfast is pretty distant in my mind. If I remember, I might just grab a granola bar, a Luna bar or something of that power/energy bar ilk. Once in a blue moon, I go high style and pick up an egg sandwich somewhere in Manhattan on my way to work. Between the coffee and the energy bars, my mornings can get expensive. I also feel guilty eating the overly processed granola bar products? I mean, really. I do love that whole coated in chocolate aspect of the Luna bars. At $1-2 a pop though, is it really worth it? I started researching homemade granola, and homemade granola bars. To be honest, diving into this realm is not the best idea for me. My gut truly can’t handle most homemade granola bars. My gut should can only handle that processed stuff. Still, I wanted to try to make my own power/energy granola bar and feel some crunchy granola bar power. I knew what I wanted in there: some combo of oats, flax, wheat germ, almonds, dried fruit, and chocolate chips. But what else goes into that perfect bar, and how much? There are many recipes out there. Using my math skills, I came up with what I think works for us. Even my picky 8-year-old, who prefers bars of the “Kudos” variety approved of this nutty good-for-you power bar. There are some modifications I may make next time, aside from processing my ingredients, so it isn’t too nutty for me. I may go all honey and no sunflower butter. Also switch up the fruit. I would like to play with some nut combinations. Maybe throwing in a pecan or two. Combine all the nutty stuff on to a baking sheet and toast at 350 for 15 minutes. Stir the mixture around every five minutes. When done, dump in a large mixing bowl and cool down. Stir in the coconut, dried fruits, and choco chips in to the mixture. Turn the oven down to 300. Get a 9×13 pan ready. Line it with parchment paper. In a small saucepan, add the sugar, the nut butter, the honey, the vanilla, and the salt. Stir up until the brown sugar has dissolved. Just a few minutes. Let cool a couple minutes. Pour the sticky mixture over the granola mixture and stir. Press the mixture into the pan. Press down so it’s all even. Bake at 300 for around 25 minutes. When done, remove from oven and let cool on counter for a good 30 minutes or so. Slice into granola bar shapes – anything goes really. Enjoy! Wrap in plastic wrap. I prefer the “Stretch-Tite” brand. Saran is for wimps. Enjoy your bars. Really. it has been way too long. I really have been cooking. I haven’t just been feeding my kids fish sticks and mac and cheese out of a box. Though I have to admit, there have been many days where that is the only thing I feel like cooking. No, it’s not what you are thinking…I am not pregnant. All is ok.
Dijon Mustard – 2-3 tbsp. Ginger Paste – 2-3 tbsp. In a roasting pan, lay out your cut veggies. Pour on a couple tablespoons of olive oil, salt, and pepper, and a portion of your chopped herbage . Mix them up a little bit. Lay the chicken on top of the vegetables. Consider the vegetables a sort of nest for the chicken. 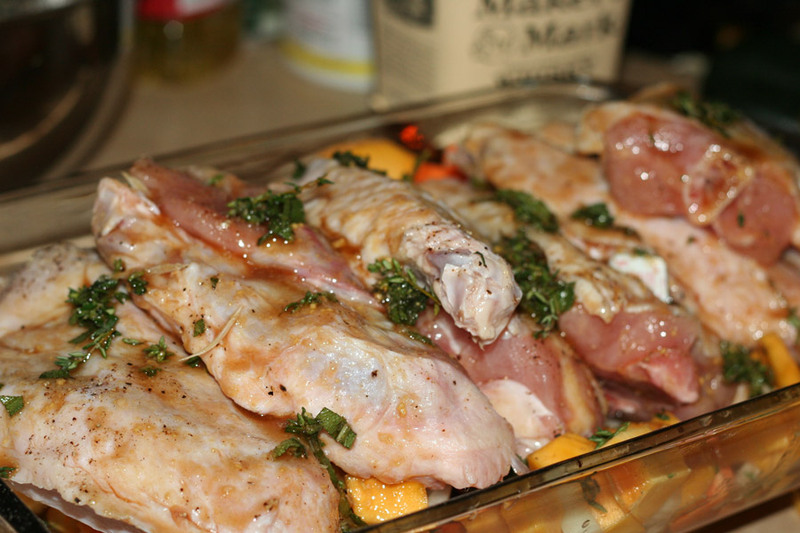 If using a whole chicken, fill the chicken cavity with the halved lemon, some herbs, and a few garlic cloves. 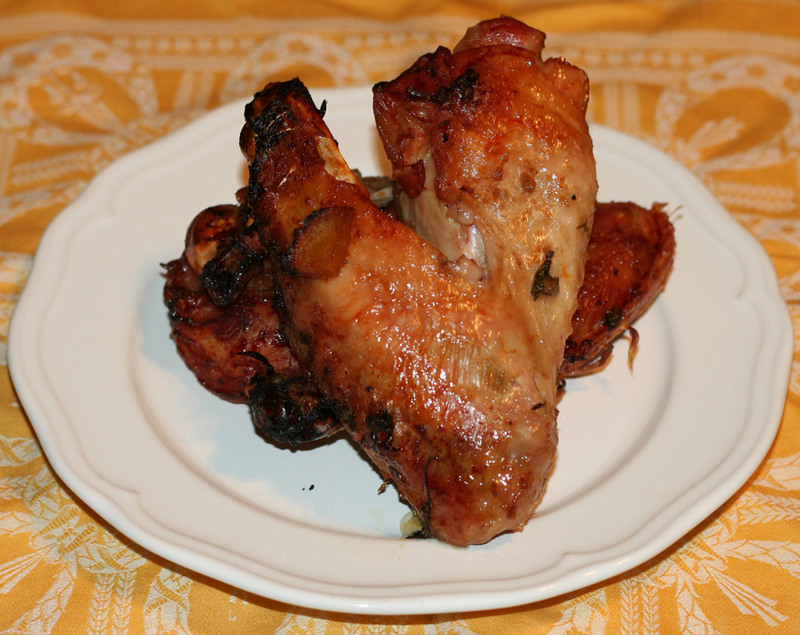 If using chicken cut in pieces, sprinkle lemon juice, salt, and pepper over the chicken. Mix up the maple syrup, ginger, mustard, olive oil, garlic, and herbs. Pour over the chicken. Place in a 375 degree oven covered for an hour. Remove the foil after an hour. Place back in oven for another 45 minutes. Enjoy!